PureClarity is designed to provide a highly personalized visitor experience in order to increase sales conversions and build loyalty. It analyses visitor behavior at three different levels to present search results and recommendations that are highly relevant. 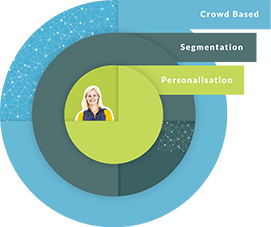 The three levels of data analysis are crowd-based, segmentation-based and individual, which is highly personalized. Crowd-based- analyzes the behavior of everyone as group to see what is trending and what is relevant, e.g. ‘Everyone’. Individual Personalization– collects data about a user’s individual behavior including likes and dislikes, views, purchases, searches, to show product, brand and category recommendations that are most relevant to that individual. PureClarity uses all three levels of analysis to formulate a personalized user journey based on what it knows about the individual. For people it doesn’t know, it presents results that have resulted in conversions for people who in the past have performed similar behavior; for those it knows well it tailors highly personalized results.